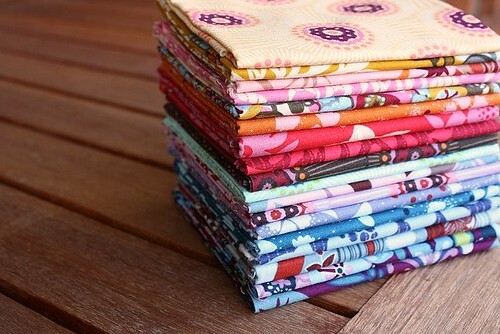 Today, I summoned the courage to cut into my precious stash of Anna Maria Horner voiles. 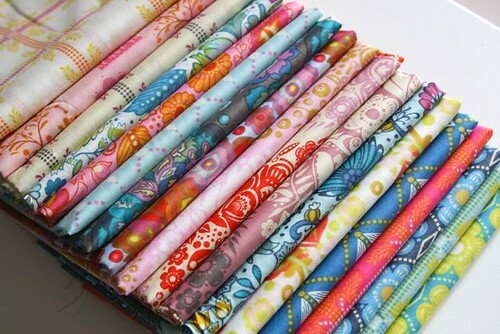 The word that sprung to my mind to describe these fabrics is 'diaphanous'. On checking, diaphanous = 'light, delicate and translucent, esp. of fabric'. Exactly! 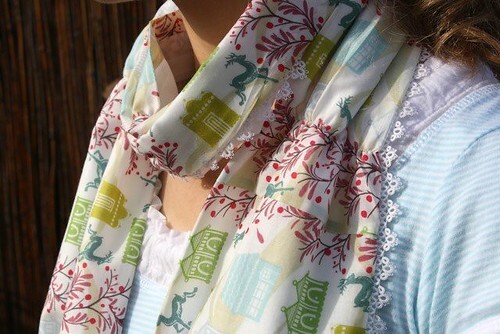 A light and pretty scarf for summer. I have been hoarding the divine lace edging for several years now. My sister-in-law bought it for me at a laceworks in Italy, and I have been keeping it for 'something special'. I took photos as I made this scarf, so I hope to be back soon with a tutorial. It makes for a very quick and easy Christmas present. I am on a bit of a Anna Maria Horner binge at the moment. This is my stack of 'Innocent Crush' just waiting to be transformed. I purchased these from Cathy at Wondrous Woven Fabrics who I highly recommend. While it waits for inspiration to strike, my stack sits prettily and is stroked regularly!